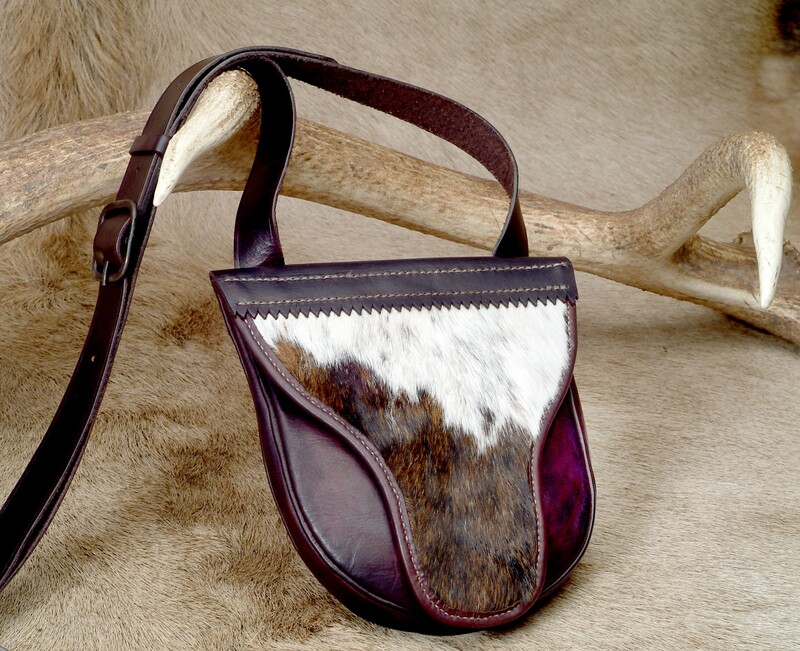 The beaver tail hair-on bag at the top left is a typical "D" shaped bag with a flap in the shape of a beaver tail. 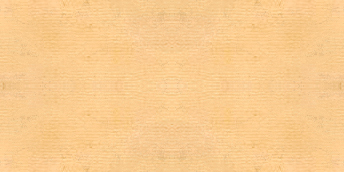 It is hand stitched with waxed linen thread and is made of vegetable tanned leather and a hair-on calf skin flap. The "D" shaped bag in the middle has a variation on the beaver tail flap. 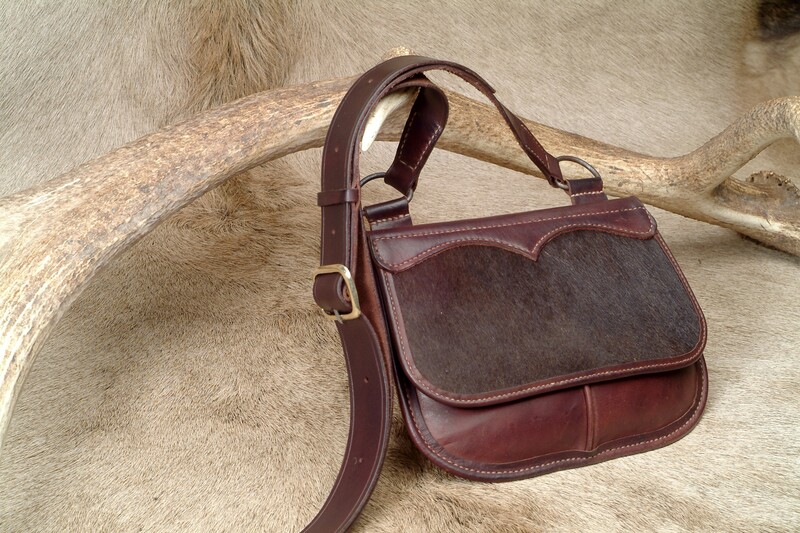 This bag is also made of calf skin with a hand cut scallop design. 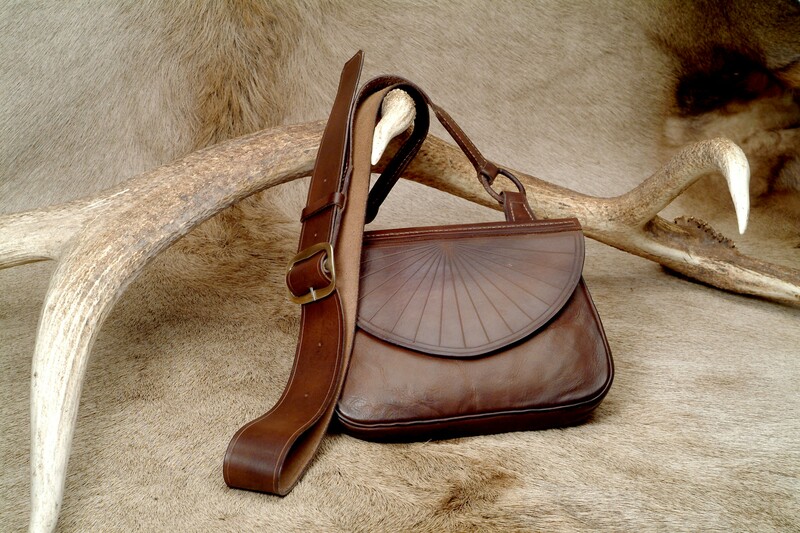 The sunburst bag on the right is hand tooled with a "sunburst" on the front flap. The bag itself is a modified "D" design. 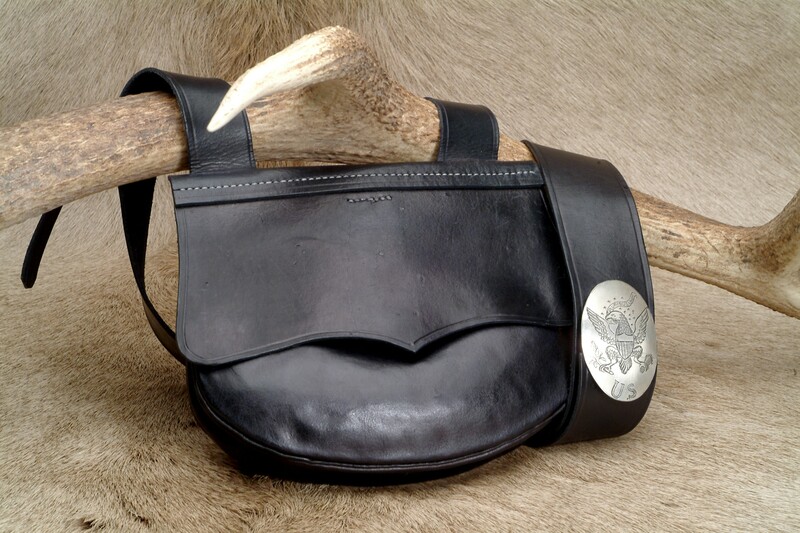 This bag is an example of a gentleman's hunting bag and would have been used with a fine hunting rifle and accessories. 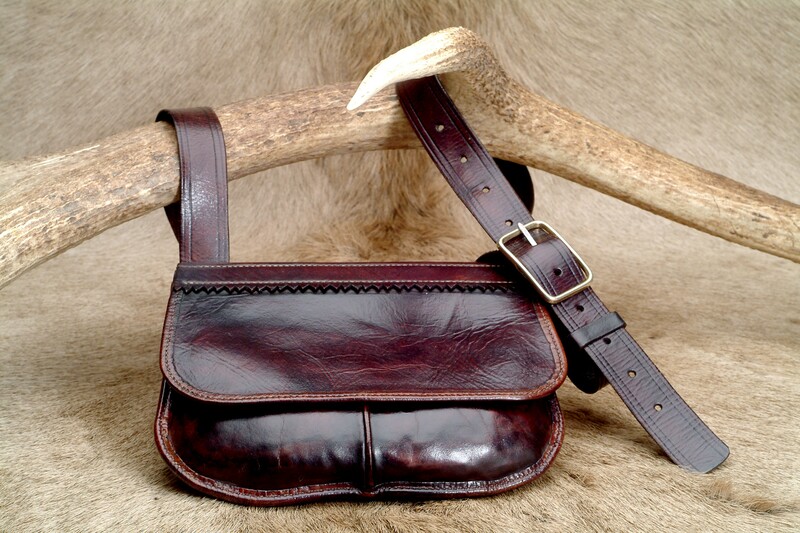 The bag on the bottom center is a kidney shaped bag that has a doubled paneled front, with welt and is based upon an original documented by Madison Grant in his book The Kentucky Hunting Pouch. The bag at far bottom right is the Jim Pease bag that is crafted on a similar design with a "wing tip" and hair-on flap. The bag at bottom right is a reproduction of those carried by the Lewis and Clark Expedition. 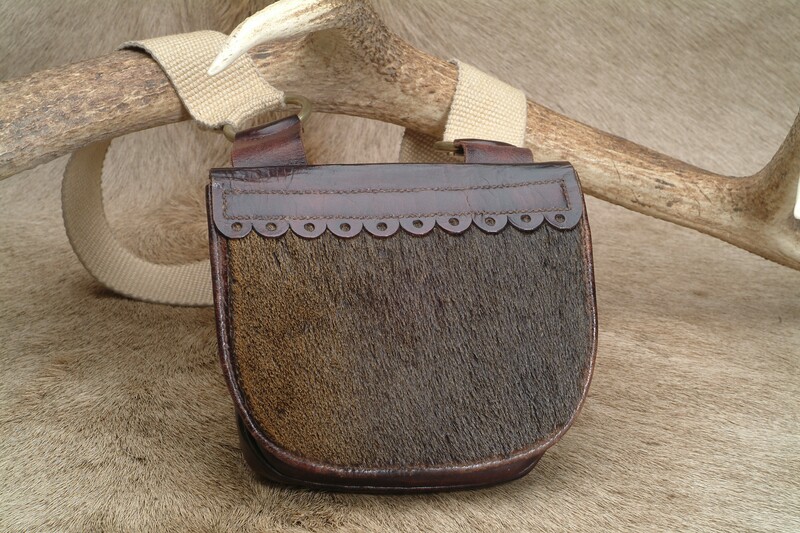 This is a military style, double pouch, early 1800's bag with a silver cross belt shield. All bags above are constructed of vegetable tanned leather, hand sewn with waxed linen thread, wth a hand dyed and burnished finish. Please click on any picture to see the bag in more detail.